Well I'm on a break from stitching. Not intentionally trust me! Too many other things crowding out my stitching at the moment. I have got some done on my Heart Strings project. I've pretty much finished the one piece except for the backstitch and the bits I was gonna do in sparkly thread. I haven't had the time or money to match and buy the sparkly thread I wanted so I'm just gonna finish it off in normal DMC. Then I just need it framed and I can take a pic and post it off. Then you can see it! Oh, I did get some beads for it from a LNS in Deal, Kent last week. A real nice shop on the seafront. Sold mostly knitting yarn but had Anchor threads and wool and a few different kits and such. He also sold fabrics which was cool. A friendly guy served me. I tidied up my stitching corner again yesterday. Rearranged some stuff in my sewing box, put things away. I got some floss for one of my trades this week so I spent ages writing out the bobbins and re arranging all my threads. I have 3 boxes of DMC now. My Anchor threads are quite neglected at the moment. Once I've all the DMC I will start back on my Anchor threads. I'll get them from my LNS though. Have to do my bit to keep it going I guess! Anyway, I better go. I need to sort out my group mail. I had to have my PC wiped clean this week so now I have to set up Thunderbird all over again and I can't remember how to do it! I got round to scanning a load of my charts and uploading them to my photos so I can trade them. I've still got loads and loads left to do though. At least when that's done all my charts will be sorted out. I spent ages yesterday looking for a chart book I have and still can't find it. So annoying! Haydn (a cousin) will have his 1st Christmas this year and although I don't really do seasonal stuff, I thought it would be cute to make a stocking for him. Now I know for a fact I bought a chart book of stocking patterns. I guess I'll have to think of something else instead. One good thing came out of it. I went on sewandso.co.uk to see how much stocking kits would be and found some gorgeous old Victorian style ones by Just Nan. I won't use them myself but one of them would make the perfect pressie for a friend of mine! Good excuse for stitching something I like but won't keep lol! Now I just need to save up some money to get it. I also found another addition to the Bothy Threads Cut Thru series. 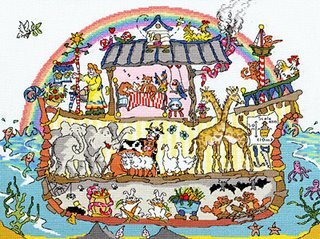 It's Noah's Ark and it's right whimsical and crazy. I love these but I'm not sure I'll ever stitch them. I wouldn't know where or what to do with them. Who knows though I may be tempted... Here's a pic anyway. Anyway that's all the goss for now. I'm off to Wardle for work tomorrow so no stitching and no internet 'til Sunday :( Can't wait to get a proper job! Think of all the time I'd have to cross stitch in my own home....ah bliss!!! Two students at the University of Michigan dressed up as Pac-Man and a Ghost respectively, and ran through the UGLi (the Undergraduate Library) and the Fishbowl (a huge computer lab on Central campus) during finals week. Well I've hardly done any stitching since my last update. I got one good day in where I almost finished the 1st half of Heart Strings and that's about it. I think my Feathers & Friends will have to be given up on as a September deadline as the next 2 weeks are gonna be pretty cross stitch free. Between finishing up my college work, applying for jobs, doing the one I've got and visiting Craig's brother next week I won't have much time. Think I'll have to stick to the cake section in the show this year instead LOL! Anyway, today while surfing the net I found this real funny Pacman related video. It's a bit 'off topic' but I wanted to share. I think it should be in a separate post if what I just did works. Um...well we'll see! Otherwise I'll post a link LOL! Well, I've not got much to tell... I've been working on my secret project this week so no pics. I've nearly finished the 1st half. I just need some beads and some shiny metallic threads to finish it off. Only thing is I'm a bit broke so I've been working on the other half while I get some money together. 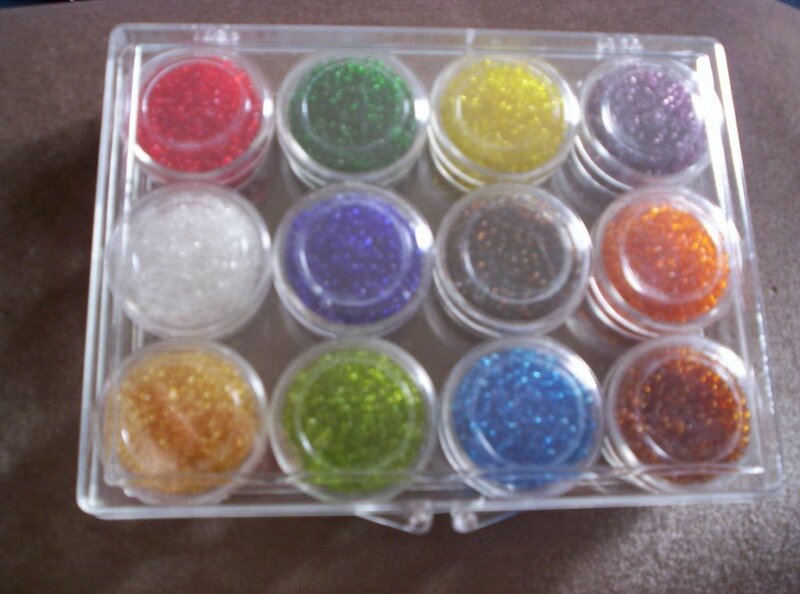 I also need to match the DMC colours with the beads/shiny stuff so it's proving to be an unusual challenge.